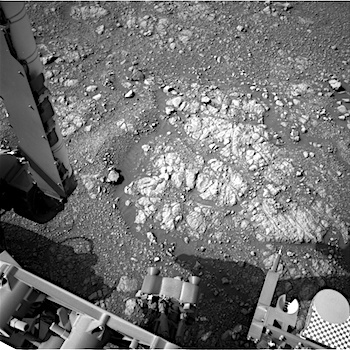 Sol 2252-53, December 5, 2018, update by MSL scientist Abigail Fraeman: Even though they looked promising from a few meters away, this morning’s workspace images showed us that the red Jura rocks we had hoped to drill are too fractured to drill safely. The texture of these rocks is actually fairly typical of the red Jura rocks, so finding one that is drillable may be challenging. This entry was posted in Reports and tagged Aeolis Mons, Conan Mains, Curiosity, Dunecht, Gale Crater, Jura, Knochan Crag, Mars Science Laboratory, Mount Sharp, MSL, Murray Formation, NASA, Skatie Shore, Stronecraigs, Vera Rubin Ridge. Bookmark the permalink.